In 1994, I moved to Los Angeles to attend film school, and I quickly discovered a local hangout called Barney’s Beanery. It was one of those places that hipsters would call a “dive”, which meant the décor was fashioned to look old and tacky but there weren’t actually any creepy drunks lingering around to bring everyone down. My friends and I used to hang out there and talk about movies, because we heard Shane Black went there to write, and because the menu was full of the kind of deep-fried pub food that we were too young to realize we shouldn’t be eating so much of. Then one day, the one openly gay guy in my MFA program (I wasn’t yet brave enough to come out myself) told me why he never joined us when we went there. “The owners are homophobes,” he said. 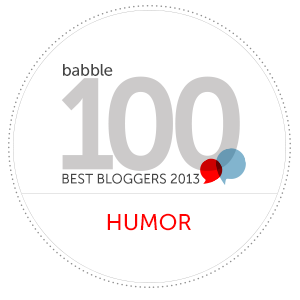 I think at this point I probably laughed, guffawed even. 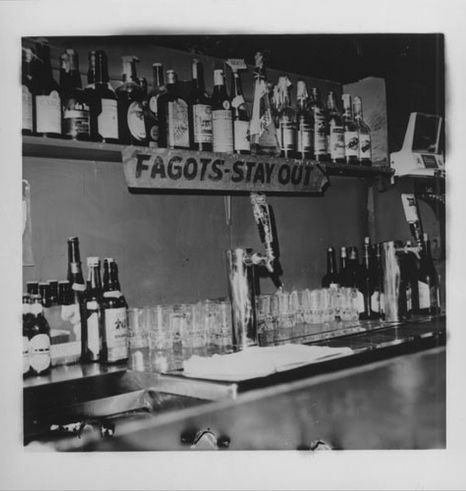 The idea was so absurd, not only because it seemed like the kind of blatant Jim Crow bigotry America had supposedly done away with long ago, but because Barney’s Beanery was in the middle of the gayest part of town. Walk a couple of blocks in either direction from Barney’s and you’d undoubtedly find yourself face-to-jock strap with a go-go boy dancing on a bar. It was my “Soylent Green is people” moment (sorry for the spoiler if you haven’t seen “Soylent Green”). He was right. Barney’s Beanery was situated among the gayest gay bars in Gaytown, yet it was full of the straightest frat boys you’d ever seen. When my friend told me about Barney’s no fags policy, I felt sick. I wanted to retroactively barf up every onion ring I’d ever eaten and every drop of cheap beer I’d ever drunk there on their front steps. One thing was for sure. I was never setting foot in Barney’s again. Now, thanks to the Indiana state legislature and its governor, Mike Pence, millions of people in a Midwest state have the right to do just what Barney’s did. Sure, they’re not asking to exercise that right quite as crudely, but then again, maybe that’s the problem. I’m not going to argue the merits of this law. If you want to read someone doing that much better than I can, check out Supreme Court Justice Anthony Kennedy’s eloquent and thorough smackdown of a similar law in Colorado in Romer v. Evans, from 1996. Laws like this are nothing new. They spring from a decades-long effort by well-funded anti-gay hate groups who are determined to legitimize and spread their bigotry. Every few years, these obsessive Grinches regroup with a slightly different strategy, usually in a different state, where they rewrite their last bill and try again. Sometimes it works, sometimes it doesn’t. They’re convinced this is a cultural war, and if it is, I’m ready to admit that it might not be one we can win. Sure, we can boycott Indiana, but then the people who got this law passed will just cry oppression even louder, and at the same time, we’ll end up hurting lots of good-hearted, open-minded Hoosiers who are as disgusted by the law as many of us out-of-staters are. I’m tired of fighting back, and I’m tired of arguing. I’m tired of using my time, money and energy trying to force bigots to make me a wedding cake. We both think someone’s trying to infringe on our freedom, that the other side is out to oppress us. Again, I could argue this point, but I’m tired of it. They’re not going away. They’re determined to win. So I say it’s time to let them. They want the right to discriminate? They can have it. You don’t want to cater my gay wedding? You don’t have to. You don’t want to give me the family rate at your pool club because our family happens to have two dads? Fine with me. You’re a jeweler who’s willing to turn down the sale of two diamond rings because the women buying them plan to give them to each other? Hey, it’s your business. 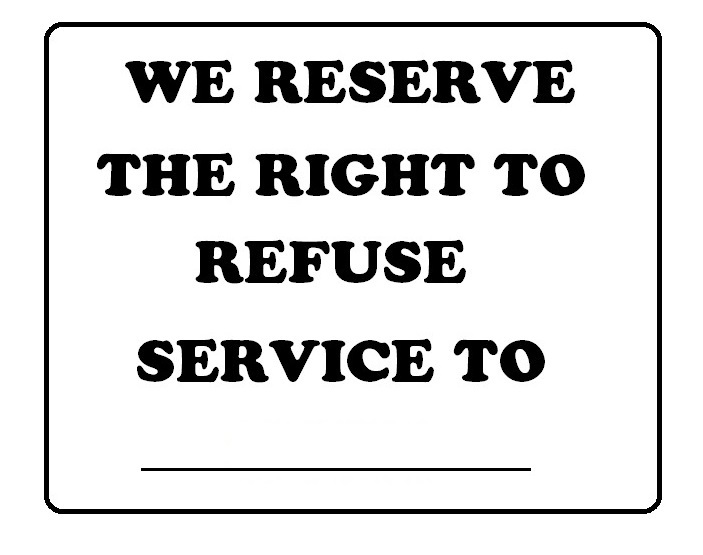 You know those signs that businesses put up that say “We reserve the right to refuse service to anyone”? Well, from now on, if you choose to reserve that right, you have to hang one of those signs on your front door. And you have to be specific. That spares me the embarrassment of coming inside your business only to get turned away, and it saves you the unpleasantness of having to tell me to my face that you don’t think I’m morally upstanding enough to savor your rich buttercream frosting. It’s win-win. It’s customizable! You don’t want to serve African-Americans? Write your favorite slur in the appropriate spot. Jews make you uncomfortable? Fill in the blank. 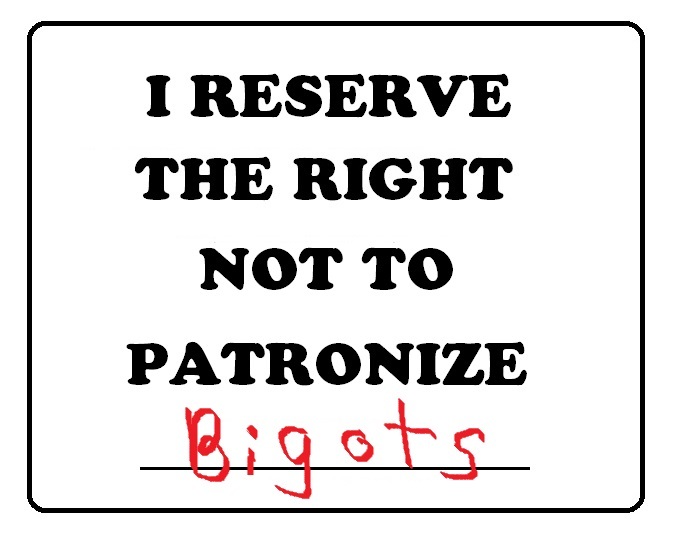 This one sign will work for whatever group of people you find distasteful. Muslims? Transgender people? The disabled? Did you see the sign? Buh-bye! You don’t even have to claim religious oppression to do this. I don’t care what your reasons are, and I don’t care what you put in that blank, whether it’s my group or not. If I see that sign in your window, I’ll just quietly move on and give my business to someone else. I think, if you’re really willing to own your right to discriminate, you won’t just lose the business of whatever minority you feel your bottom line can do without. You’ll lose everyone who sees discrimination for the divisive, un-American garbage that it is. You can’t spit on me and then act all nice and innocent with my straight friends, not anymore. 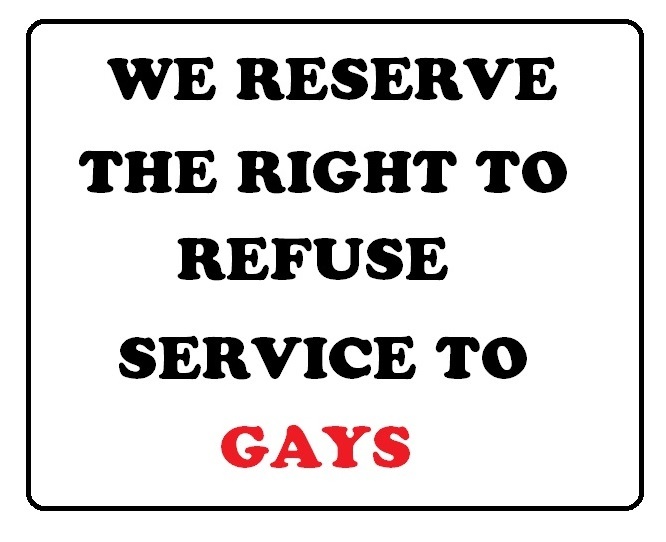 You want the right to refuse someone service because of who they are? Put your money where your entrance door is, and see who’s still willing to walk through it. A lot has changed since Barney’s Beanery took down their sign. (Even Barney’s, now under new ownership, seems to have made peace with the community.) Back then, there were no such thing as straight allies. Well, judging from my Facebook feed, my straight friends have my back, and I have the backs of all my friends, too, no matter which model in a Benetton ad they most resemble. Turn away any one of us you want, but only if you’re willing to run the risk of losing all of us. You reserve the right to be… awesome. If you agree with my modest proposal, spread the word by sharing this post on your social networks with the buttons below. I may have mentioned I’m a dad, with kids to feed. I also have a great, funny story to tell of how I became a dad. So forgive this shameless plug for my book, Mommy Man: How I Went From Mild-Mannered Geek to Gay Superdad, which is available at non-discriminatory booksellers everywhere.